It was, perhaps, inevitable. First we had the AWS900. Then the Matrix. And now the Nucleus. With each step, SSL have progressively scaled down their high‑end DAW-control paradigm to reach successively less pecunious studio owners. However, there's more to this new device than simple DAW control, as the company have also bunged in a couple of their high‑spec preamps, a basic monitor section, and two of their new Duende Native plug‑ins, promising to lend that touch of SSL magic to all stages of your production. But before we get to all those good things, let's first look at the central, control‑surface aspect of the unit. 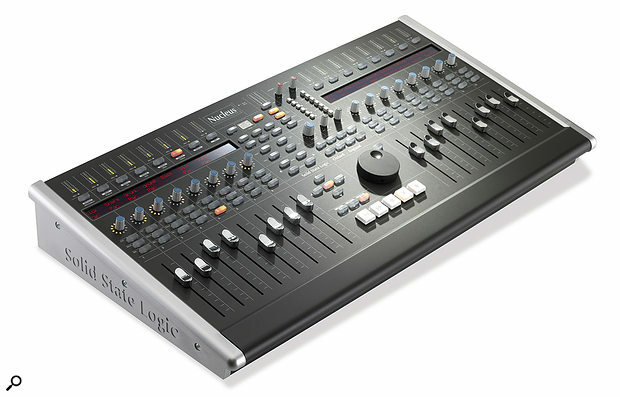 What you get in terms of hardware is 16 touch‑sensitive, motorised faders with accompanying illuminated Cut, Solo and Select buttons; 16 endless rotary encoders with a non‑detented action, internal push switches, and bi‑colour LED indicator rings; a set of transport controls; 16 10‑segment LED meters; a non‑detented jog/scrub wheel; and a further 48 chunky, illuminated buttons, most of them with user‑reassignable functions. These physical controls can drive your choice of DAW software in two different ways: firstly, by using the MCU (Mackie Control Universal, for Cubase, Digital Performer, Logic, Nuendo, Reaper and Sonar) or HUI (Human User Interface, for Pro Tools) MIDI‑based protocols, via an Ethernet connection and Nerds ipMIDI software utility; or by using ASCII‑based key commands sent via a USB connection. The basic principle of MCU/HUI control is that you can use a small number of physical faders and pots to adjust a large number of your software mixer channels. Bank and Channel buttons determine which block of mixer channels is under hardware control, and the physical fader positions and LED indicator lights update accordingly. The display indicates what function is available from each hardware control, while a Flip button swaps the parameters assigned to the faders with those assigned to the pots, allowing you to use whichever hardware control is more suitable to the task at hand. Beyond this, though, the exact implementation of the MCU and HUI control system is different for each software platform, so you'll need to investigate your own DAW's manual to find out what exactly you can expect to be able to control from the Nucleus when using its MCU/HUI commands. This, say SSL, is a conscious decision to provide a 'platform agnostic' approach, implementing all the available commands in the two protocols, and then allowing the user to assign those commands to the available hardware controls as best suits their requirements. Testing the MCU protocol with Cubase 6, SSL had certainly implemented all the MCU functions I expected to see there (with the exception of master‑fader control, seeing that the Nucleus has no separate master fader), and I've no reason to suspect that they've been any less thorough with the MIDI protocols for the other DAW platforms. Although there's something to commend the 'platform agnostic' control approach, relying on the MCU and HUI protocols does mean that some control functions are subject to the limitations of the protocols themselves. So, for example, SSL's included Remote software won't provide you with any way to remap your favourite plug‑in parameters to the most conveniently accessible rotary controls, or invert a control's polarity, simply because that goes beyond the scope of the protocol. There are workarounds to implement this kind of thing on some platforms (such as the custom Mackie Control layers in Logic), but you're in the hands of your DAW software developers, and SSL haven't provided anything like Novation's Automap facility to allow you to reassign plug‑in parameters to the hardware more freely. Maybe it's just me, but I somehow expected more from a company like SSL in dealing with this particular workflow issue. The real powerhouse of the Nucleus control capabilities, for me, is the numerous assignable buttons. For a start, the facility to assign either MCU/HUI protocol commands or ASCII keyboard commands (including combinations involving modifier keys) will allow you to fire off pretty much any software sequencer action you want these days. But on top of that, SSL have implemented similar tactics as used on their Matrix console (reviewed back in SOS September 2008) to expand the number of key assignments well beyond the number of physical buttons available. The Nucleus's front panel is larger than you might expect, measuring 385mm by 730mm. The secret to this is the two User modes, engaged from dedicated buttons at the top of the Nucleus's centre section. Once you're in one of the User modes, the eight right‑hand rotary controls act as a new set of assignable buttons (via their internal push-switches), overriding their normal parameter‑adjustment action. The illuminated buttons above the rotary controls can also have new assigned functions in User mode, with the corresponding displays reminding you of each control's assigned function. However, the upper buttons can alternatively be used to switch between up to nine banks of rotary‑control switch assignments, which means that, overall, the User modes allow you to access a total of 144 additional functions. Certainly more than I'd ever need! That said, I did find myself wondering why the User mode only allowed reassignment of the right‑hand side controls/displays, and not the left‑hand ones too — as I see it, the extra instant‑access controls would more than make up for any additional inconvenience arising from overriding the normal operation of those hardware assets. As if the blizzard of potential button assignments were not enough, the unassuming DAW 2 and DAW 3 buttons above the jog wheel take things another step further, effectively tripling the control functionality by offering two further complete control‑assignment setups feeding different Ethernet MIDI ports. This allows the Nucleus to control three different software applications independently if you wish, something that will clearly appeal to those musicians who use more than one piece of software for their music making — Logic for MIDI programming and Pro Tools for audio work, to take one common example. What's more, the Nucleus can even be set up to control software applications on three separate networked computers, in conjunction with a network router and USB‑equipped KVM switch, a feature that will surely win it friends amongst media composers running enormous virtual instruments from people like VSL or East West. (The inclusion of a four‑port USB hub at the rear of the machine makes a lot of sense in this context, making it easy to switch your keyboard and mouse in tandem with the Nucleus.) But even if you only run a single software application for your music making, the DAW2/3 switching can still serve a purpose for generic MIDI control of instruments and effects; see the 'Generic MIDI Control' box at the end for details. The Nucleus Remote software utility allows you to customise the Nucleus button assignments and other setup options of all three available DAW‑control layers. To handle all the configuration complexities, SSL have provided the dedicated Nucleus Remote software utility. This is fairly easy to use, allowing you to create assignments for all the available buttons (as well as a rear‑panel dual‑footswitch input) in each of the three DAW setups, via little drop‑down menus. Needless to say, though, it would take a fair time to set up everything from scratch, so it's nice that SSL have included pre‑programmed DAW profiles for Cubase, Nuendo, Logic and Pro Tools which you can use as a starting point to get you up and running quickly. Other profiles are apparently in development, for software such as Live, Reason and Reaper. 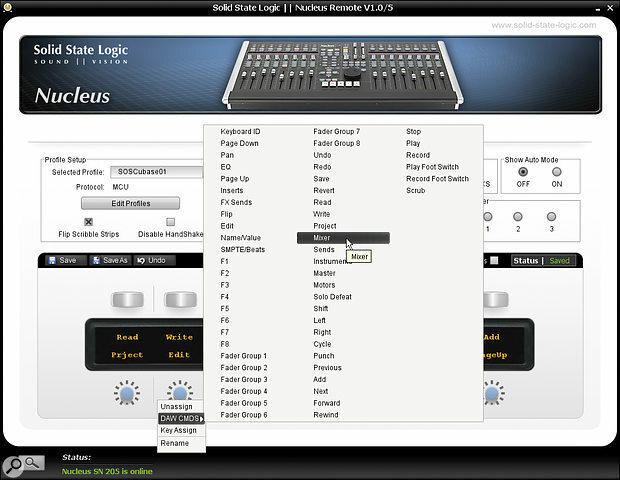 Nucleus Remote also lets you switch the jog wheel to scroll track selection, which saves a bit of wear on the Channel/Bank buttons in larger projects, and gives you the sensible option to force all transport commands to go to a specific DAW, regardless of the DAW layer you happen to be using for other control purposes. Edited profiles are saved via an SD card slot and can also be backed up directly to your computer. The USB connection between the Nucleus and your computer isn't just for triggering ASCII keyboard commands — it can also provide simple four‑in/four‑out audio interfacing, comprising a stereo I/O pair in both analogue and digital formats. Sample rates of up to 192kHz are supported, and a supplied Nucleus Control Panel software utility provides access to the all‑important buffer settings. Two small software mixing matrices are included with Nucleus Control Panel, one that can route the inputs directly to the outputs for monitoring purposes during recording, and another that routes up to three stereo playback streams from the software to the outputs for auditioning. A digital loopback is also on hand to pipe audio between different programs. The audio interface's single stereo A‑D converter is fed, via a switchable insert point, either from a pair of built‑in mic preamps (see the 'Superanalogue Preamps' box for details) or from the output of the interface's own D‑A converter, depending on the setting of the little Mixdown button in the Nucleus centre section. This means that the insert point can serve double duty, allowing post‑preamp analogue signal conditioning during recording, or analogue bus processing during the mix. Monitoring facilities are pretty simple, with a single monitor mix supplying four stereo monitoring outputs: one balanced at +4dBu on XLRs and one unbalanced at ‑10dBV on RCA phonos, both subject to the main Monitor knob's level setting; and two headphone outputs on quarter‑inch TRS jacks with a shared Headphone Level control. When the Mixdown button is active, so that the D‑A converter's output is looped back to the A‑D converter's input, the monitor mix receives the same signal fed to the A‑D converter. However, this monitoring signal can be replaced by the summed stereo signals from the rear‑panel External (balanced XLR) and iJack (unbalanced stereo mini‑jack) inputs, if the EXT iJack button is lit. If the button above EXT iJack (the one labelled with the Greek letter Sigma) is also lit, then the A‑D, External, and iJack signals are all monitored together instead. All of the Nucleus's connections are found at the rear of the unit. Analogue audio sockets are on the left, and digital audio and computer connections are on the right. Switching the Mixdown button off, so that the A‑D converter is fed from the preamps, makes the monitoring a little more complicated, because it means that the default monitor source then becomes a mix of the A‑D converter's input (ie. the post‑insert preamp signal) and the D‑A converter's output (ie. your computer's playback), the balance between them adjustable from a single Blend knob. In this case, the two post‑insert preamp signals will normally be presented to the monitor matrix as the two sides of a stereo pair, but if this isn't appropriate, the Mono L and Mono R buttons allow you to hear either or both signals in the centre of the soundstage instead. (These buttons sensibly do nothing when Mixdown mode is active.) What this means in practice is that it's quick and easy to set up true zero‑latency monitoring of a singer/instrumentalist, and to balance their level in the headphones with a backing track coming from the USB interface. Similar monitoring systems on some products I've tested have suffered from underpowered headphone preamps, making it difficult to get enough monitored vocal level while leaving sufficient A‑D converter headroom, but there appears to be enough juice in the Nucleus circuitry to avoid that pitfall. While the Nucleus's individual channel meters display level information passed from your DAW via the MCU/HUI protocol, the main stereo meter is an analogue device, and can tap into the Nucleus circuitry at two different points. By default, its reading follows the main monitoring signal, but if the Mic button below it is lit, then it shows the level arriving at the internal A‑D converter, whether that's coming from the preamps (Mixdown button inactive) or the D‑A converter (Mixdown button active). Each Nucleus button can have assigned to it any MCU/HUI DAW-control function (you can see all the MCU options in this screen) or a user‑definable ASCII keyboard shortcut. So much for the raw functionality of the Nucleus — the real question is how well it works in practice. On my machine, the initial setup wasn't exactly plain sailing. Despite my best attempts at interpreting the installation and user guides, the Ethernet‑based MIDI interfacing was unusably flaky at first, necessitating a call or two to SSL's technical support. However, once I'd disabled ipMIDI's default MIDI Loopback setting and manually entered the Nucleus's IP address into my Windows XP Network Connections TCP/IP settings (neither of which steps I could find in the Nucleus documentation), these functions began behaving as they should and gave no further problems during the review period. My USB audio interfacing also suffered persistent audio glitching to start with. However, this glitching turned out only to manifest itself when the Nucleus was connected to certain of my PC's rear‑panel USB sockets, while others worked fine (an issue that SSL also noticed on another machine they tried out). Again, though, once I found a USB socket that worked, the interfacing proved perfectly reliable during the remainder of the review process, and I was able to achieve an excellent throughput delay of only 7ms without audio drop-outs when running the ASIO buffer size of 66 samples — albeit only for very CPU‑light projects! Once these hurdles had been cleared, life with the Nucleus became altogether more pleasant. It's quick to respond and feels solid to the touch. The chunky transport and assignable buttons are a joy, and the large jog/scrub wheel has a reassuring weight to it. Zipping around my Cubase and Reaper projects was a breeze with the band and channel keys, and the dedicated cursor/zoom keys were very handy too. Given my own penchant for customisation, it wasn't long before I was delving into the options offered by the Nucleus Remote software, and it proved to be a relative no‑brainer to set up pretty much any button function I wanted, whether using MCU commands or ASCII keyboard shortcuts. Switching profiles appeared to work smoothly, too, when I operated the Generic MIDI profile alongside the MCU profile to achieve more flexible plug‑in parameter assignment within Cockos Reaper. Despite the favourable overall impression that the Nucleus left me with, however, I did experience some operational niggles. The first thing that I came across was that it was unable to trigger modifier keys in the same way you'd expect a QWERTY keyboard to do. Although it was possible to set up any modified keyboard shortcut (say, Alt‑Ctrl‑Shift‑'L') using the Remote software, if I assigned just a modifier key (say, Ctrl) to any of the assignable buttons it didn't appear to work properly — it triggered the key on/off action, but didn't allow me to 'hold down' the key so as to modify any other actions. For my part, I found this annoying, because I use modifier keys a lot to adjust mouse actions during audio editing (amongst other things), but it's possible that it may not bother you unduly, depending on the way you work. SSL told me that they had prevented 'modifier holding' in this way in order to avoid operational peculiarities if the user switched DAW layers while a modifier was active, and although they said that they were looking into it, they provided no concrete assurance that a fix would be forthcoming. I also found the response of the non‑detented rotary controls a little unpredictable when using them to adjust switched plug‑in parameters, such as individual EQ‑band bypasses. I didn't feel I could always rely on the switch responding as I hoped when twisting the knob, and the knob's internal push‑switch didn't toggle the software switch state as I'd hoped it might. As far as recording and monitoring were concerned, I felt that the built‑in circuitry and interfacing handled things capably and effectively, and (with the exception of the Pad‑switch concerns I describe in the 'Superanalogue Preamps' box) I couldn't fault this aspect of the machine at all, within the limits of the facilities provided. Included is the acclaimed SSL bus compressor plug‑in. Overall, I'm happy to say that on the whole the Nucleus delivers its advertised feature set in a solid and dependable way. If you're working with software and can afford the price‑tag, it has the potential to transform the way you work, as well as providing a great‑sounding, general‑purpose, analogue front end for overdubbing, and a well‑respected suite of high‑quality processing plug‑ins. Despite this, however, it doesn't quite provide the kind of one‑stop 'hub of your computer studio' that I'd initially expected it might. 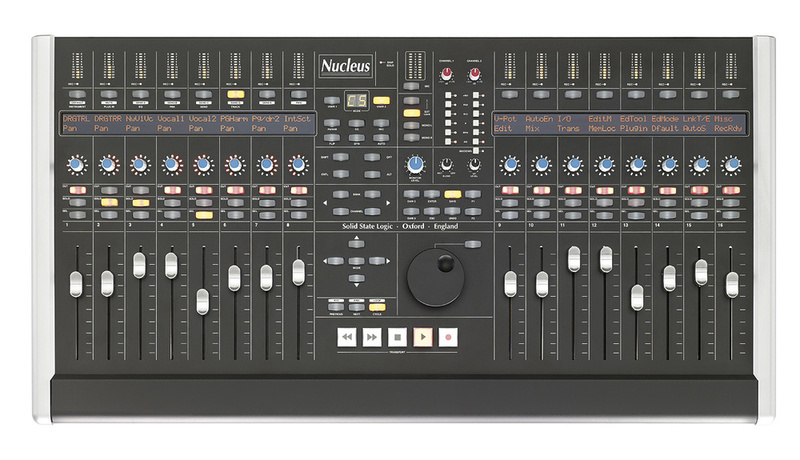 To my mind, a studio willing to spend this much cash on a Nucleus would be likely to want things like more advanced generic MIDI control, alternate speaker switching, independent headphone level controls, and proper talkback facilities, for example. As it stands, I can't help feeling that SSL have bolted together two great product ideas into something that's slightly less than the sum of its parts: a seriously customisable MCU/HUI/ASCII DAW controller, with vast numbers of button assignments; and a kind of XLogic version of Focusrite's TwinTrack Pro, featuring Superanalogue preamps and built‑in zero‑latency monitoring facilities. I can imagine considerable customer enthusiasm for either of these more specialised notional units in isolation, but I envisage that some studio owners interested in an SSL control surface might not want/need to shell out for the analogue side of Nucleus at the same time. Still, if the feature set does suit your own specific scenario well, even this kind of price tag should be considered pretty good value for money — the plug‑ins, preamplification and interfacing alone justify around half the outlay, to my mind, which leaves the Nucleus's 16 channels of control surface well‑placed against established competition in this area from companies such as Euphonix and Mackie. And, of course, it says 'Solid State Logic' on the front in bright, white, backlit letters — if you're immune to that, you've either been in this business too long or not long enough! If you're mainly interested in the Nucleus for 16‑fader DAW control, the main alternatives you'll want to consider are a pair of Euphonix MC Mix units or a Mackie MCU Pro/Extender system. Neither of these compete with the Nucleus's audio functionality, however, as reflected in the considerable price differential. As well as controlling your software through the MCU/HUI protocol, the Nucleus can also function as a generic MIDI controller, capable of generating 64 separate MIDI Continuous Controller numbers. The faders and rotary controls output numbers 0‑31 across a full range of data values, while CCs 64‑95 can be operated as toggling switches from each fader's Select button and the internal push switches within the rotary controls. You can't customise which CC number is fed from which control/switch, but (as in the MCU or HUI profiles) the Nucleus Flip button does let you swap which bank of messages is controlled from the faders, and which from the rotary controls. The Nucleus's assignable buttons remain functional within the generic MIDI control profile, and in addition to allowing ASCII key‑command assignments, as in the other profiles, they also provide three dedicated MIDI‑related functions: Store/Restore for a single MIDI Snapshot, and Refresh, which resends all the controller messages corresponding to the current positions of the hardware controls. These facilities will doubtless already be of some use, especially if your DAW software has sophisticated MIDI learn functions for setting up quick control assignments. However, I have to say, nonetheless, that I'm a bit surprised at how basic the Nucleus MIDI implementation is. For a start, you can't send anything other than no‑frills MIDI Continuous Controllers — there's no support for sending relative increment/decrement messages and no option for higher‑resolution NRPN, Pitchbend, or SysEx commands. Then there's the fact that the MIDI communication is only one‑way, which means that the positions of the hardware controls can't detect the correct positions of the software parameters they're adjusting, or respond to parameter changes made within the software. It's all a bit diddy, in my opinion, especially given how much flexibility there is on even an entry‑level unit like the Behringer BCR2000. One of the things that particularly excited interest in this product was the inclusion of two of SSL's highly regarded mic preamps, built using the same Superanalogue circuit designs as found in their large‑scale consoles. Although these preamps integrate with the Nucleus audio interface and monitoring system directly, they can be used entirely independently. Their inputs are balanced, rear‑panel, 'combi' jack/XLR sockets, and each channel offers switches for 48V phantom power, 20dB pad, polarity inversion, and an 80Hz high‑pass filter. A further Hi‑Z switch allows them to act as high‑impedance instrument inputs. The combination of a generous 75dB of available gain and the extremely low Superanalogue noise‑floor should cater for pretty much any source you can throw at this preamp (including low‑output ribbon mics), and the full, airy, but understated tone makes it eminently suited to general‑purpose workhorse duties. Bundled with the Nucleus are two of SSL's well‑regarded Duende‑series plug‑ins: SSL Channel and SSL Bus Compressor. Both are provided in their new Native incarnations, such that they can operate independently of Duende hardware. Included with the Nucleus is a Duende Native Essentials software bundle, comprising mono and stereo versions of SSL's acclaimed channel‑strip and bus‑compressor plug‑ins. Once installed, they must be authorised, either directly to a license file on your studio computer or to an optional Wibu Systems CmStick hardware USB dongle — the latter is essential if your studio computer has no Internet connection. Installation and authorisation on my non‑Internet studio computer using the CmStick was fairly painless, and the VST plug‑ins were then immediately available for use. Although I had no problems running the review machine on 230V European mains, I did receive reports during the review period that some users in 90‑110V regions had found that their hardware was running unacceptably hot. In response to this, SSL have since modified the unit's design slightly to improve heat dissipation, and they would encourage any user who feels that excess heat is an issue with their unit to contact them via sales@solidstatelogic.com. Given its price point and feature list, one of the big target markets for the Nucleus will undoubtedly be for upper mid‑range project studios, particularly for those working on Macs and making media/production music. I got my hands on one of the first units in the UK last year (before the correct drivers were even available), and I'm happy to report that the Nucleus has fitted into my studio and work schedule very well. Replacing, as it did, 24 channels of Mackie Control Universal I might have expected a drop in the level of hands‑on tweakability, given that the Nucleus only has 16 physical channels and no master fader. Happily, I can report that I haven't felt limited at all, and, more importantly, it is more stable and comfortable with Logic than the Mackies ever were. Having never really run a complex Ethernet device like this on my system before, I found the initial setup and pairing with the Mac less than straightforward, and the install guide makes the rather tedious assumption that typical users will be intimately familiar with ipMIDI, Multicast UDP Packets and DHCP servers. But, to SSL's credit, you really only have to go through this setup once, because as a companion device to my Mac Pro (using both Ethernet to control Logic and USB for the audio) the Nucleus is as solid and stable as anything you could wish for. In January, I was lucky enough to spend a morning with SSL showing me round the Nucleus and the truly dizzying array of things you can do with it. In many ways, it reminded me of how the best DAW software packages invite users to come up with their own methods of workflow, and how there are usually many different ways to do a particular task — what seems obvious to one user will come as a complete surprise to another. In this respect, the Nucleus is one of the most assignable, open‑ended, flexible and modifiable pieces of hardware I've ever seen, and the sheer range of functions you can assign to its various buttons and faders (controlling both your DAW and even OS X itself) would make even the most dedicated professional user feel like the kind of person who buys a Ferrari and only ever uses it for the light in the glovebox! This explains the slightly involved setup procedure. It might, deceptively, look like just another, albeit very pretty, box of flying faders (and if you used it solely for this, I think you'd still feel you got your money's worth), but under the hood this is a seriously professional tool. Comprehensive software control of multiple DAWs via the MCU/HUI protocols and ASCII commands. Lots of solid faders, pots and buttons, with good visual feedback from displays, meters, and backlights. Top‑drawer preamps, clever built‑in monitoring/routing facilities, and 192kHz A‑D/D‑A conversion. Bundled SSL channel‑strip and bus‑compressor native plug‑ins. You can brag about having an SSL in your studio! The Nucleus can't trigger modifier keys quite as effectively as a QWERTY keyboard can. Generic MIDI control facilities are very basic. No built‑in speaker switching or talkback. A high‑spec DAW control, audio‑interfacing and plug‑in processing bundle from one of the leading names in studio technology. While some may raise an eyebrow at its unusual combination of features, or bemoan some favourite function it doesn't provide, those people who are looking for all the Nucleus's facilities in one package are in for a treat. 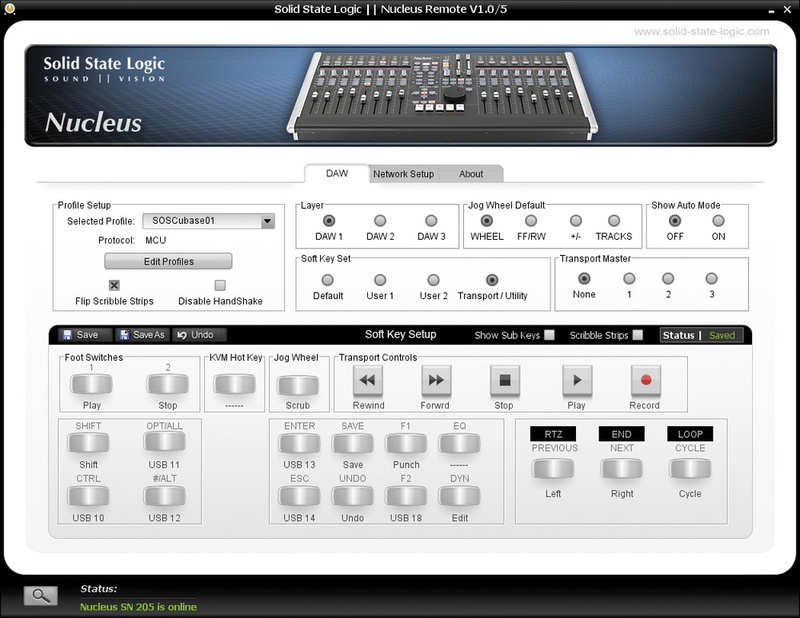 SSL Nucleus serial number 205, with v2.01 firmware and v1.0/3 software. Nucleus Control Panel software v1.26.0. Rain Recording Solstice O3 PC with AMD Phenom II X4 810 quad‑core 2.61GHz processor, 4GB DDR2 RAM, and Windows XP Pro with Service Pack 3.